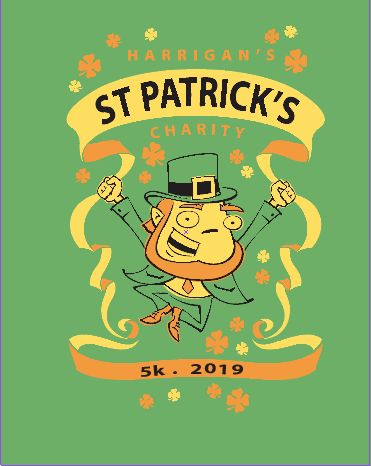 The Harrigan’s Charity 5k is on for March 23, 2019. We feature chip-based professional timing by Speedy Feet. Chip-based timing systems are state-of-the-art, and are vastly more accurate with virtually instant race results. Harrigan’s will open at 9:00 am to accommodate the runners before & after the race; K&G’s Fun Days continue with the huge K&G annual sale & other activities awaiting runners & family adjacent to the run finish. This fun 5K run/walk is part of the Young’s Ice Cream Charity Bike Tour that benefits four local charities! The Alzheimer’s Association, United Rehabilitation Services, Juvenile Diabetes Research Foundation and South Community are the charities. They all provide support and volunteers for the Harrigan’s 5K and the bike tour. Over the past 15 years, with help from runners, bikers, sponsors and volunteers, we have given $1,252,400 to our charities. Thanks so much for your past support. We are looking forward to another great 5K and bike tour this year. Up and Running will award one lucky male runner and one lucky female runner each a pair of new running shoes. Medals will be awarded for the top three finishers in each category. Prizes and medals not picked up on race day will be available during the following week at Up and Running, Washington Square Plaza, Centerville (same location as early packet pick-up). Again this year, technical running shirts for the first 150 runners to sign up!!!! Gordon Food Service will provide bananas, water, and snacks.